Let's all hail the Freedom Tower, which has now replaced Manhattan's World Trade Center. According to Juan Matamala (son of Gaudi's sculptor and right hand man), Antonio Gaudi was, in 1908, approached by a New York businessman to design a Grand Hotel for New York City. 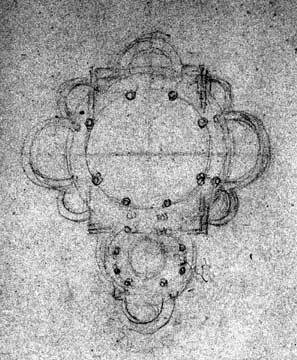 In 1956, Matemala presented a series of renderings done by himself, as well as, several crude sketches purportedly done by Gaudi himself . Altough there remain some doubts, as to the authenticity of the concept, it has nevertheless been presented in numerous Gaudi biographies. 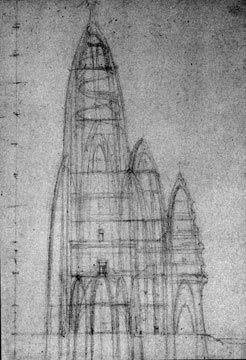 In any case, the renderings fully represent the spirit and style of Gaudi and stand on their own. Anyone looking for grandeur need look no further. The people of Barcelona, in their continuing effort to complete Gaudi's fantastic Church of the Sacred Family(Sagrada Famila) show now, as they did in the past, a great openess of vision, in that Gaudi's architecture belongs in the present and the future. It need not be a hotel. An office building would do (see 1952 color sketch of a Gaudian office building below). I like to picture a NYC skyline filled with his organic/non-linear shapes. OK, we're allowed to dream, aren't we? The above concept sketches, some dated 1952, are by Juan Matemala. 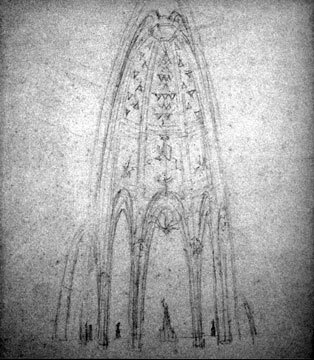 The following 3 are those allegedly by Gaudi himself. 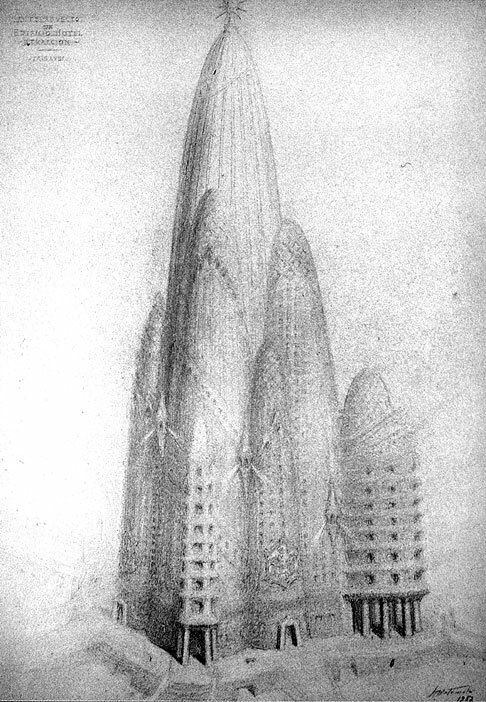 The 1952 sketch on the left is by Ignasi Brugueras Llobet who claims Gaudi in 1916, had similar plans for a New York Office building. Inspiration for creating this webpage was sparked by Paul Laffoley's article "FABLES OF THE RECONSTRUCTION-Gaudi's NYC Vision", which appeared in the Mar-Apr '02 edition of JUXTAPOZ magazine. Page 2 is an excerpt from that article. 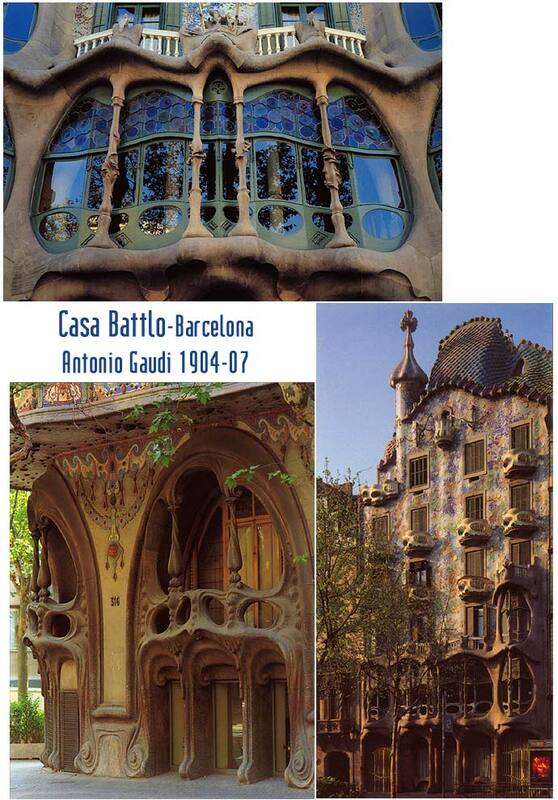 Gaudi's works, a very small sampling here: pics of Sagrada Familia & Casa Mila and Casa Battlo. Try the Gaudiclub link below for much more. Sagrada Familia offical site Gaudi's masterwork, still under construction. Some nice sketches/renderings on Free Space Comix-blog site.